Sir C.R. 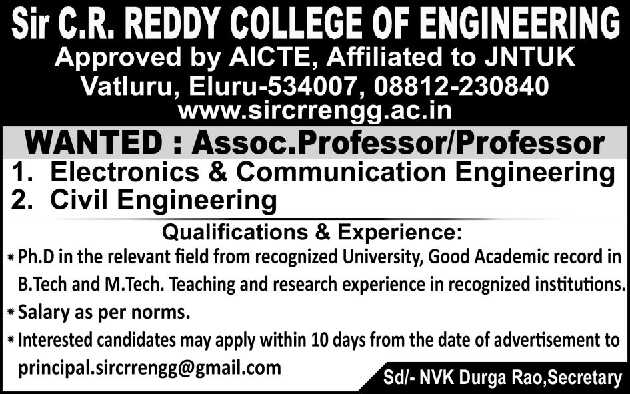 Reddy College of Engineering, Eluru has advertised in THE HINDU newspaper for recruitment of Professor / Associate Professor jobs vacancies. Interested and eligible job aspirants are requested to apply within 10 days from 13th February 2019. Check out further more details below. About College : Sir C.R.Reddy College of Engineering is the first Engineering College in Andhra Pradesh sanctioned and recognized by All India Council for Technical Education (AICTE). This College is permanently affiliated to Andhra University, Visakhapatnam. Since its inception in 1989, Sir C.R.Reddy College of Engineering has been a premier institute for quality engineering education in Andhra Pradesh under the stewardship of its broad minded and magnanimous management. The last two and a half decades has seen the Institute fulfilling its motto of 'QUALITY SERVICE & VALUE BASED EDUCATION' to the student community. Ph.D in relevant field from recognized university, good academic record in B.Tech and M.Tech. Teaching and research experience in recognized institutions.